Everyone was great to work with. I called several times due to the snow back in February but they were able to change our dates and it worked out perfect. Overall hands down our best cabin rental ever... Beautiful well-kept home and great location. Fire pit and jacuzzi were a hit with the adults as well as the kids. I had no problem with the transactions, whether online or through phone. It was one of the most affordable and yet the cabins looked great (from the pictures) and from the descriptions. Everything went very smoothly from day one. Thank you so much. I will definitely use your rental services in the future! It was a beautiful trip and we all wished we could stay longer! Bryson City is a quaint adorable town that fortunately is close by. I had no problem with the transactions. Whether online or through the phone. It was one of the most affordable and the cabins looked great. Easy. minimal contact required... That's a good thing! Love the "checking on you" call the day of arrival. 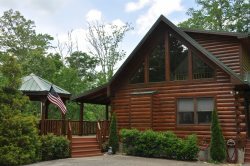 The staff over the phone was very helpful in suggesting cabins that would suit us. We love it! Very calm and quiet place. Very relaxing environment. We love the privacy of the property. The cabin is really clean. We would definitely like to visit it again in the Fall to enjoy the color change. Every staff member that I spoke to was very helpful, informative and polite. The working members of the team were very kind and courteous. First Impression and every impression thereafter were wonderful! This is just what we were looking for our spring break. Beautiful cabin and clean details a bonus. We want to make this a yearly get-a-way. Thank you. P.S The snow was a nice touch. When we planned our last minute Spring Break getaway, we crossed our fingers and hoped for the best. This place far exceeded anything we imagined! Cabin was exceptional as were the views, the weather and the area hiking. We will highly recommend Wengen Chalet to friends and family. After driving around we know that we picked the absolute best place to stay. The staff was great to work with. Very friendly and helpful!